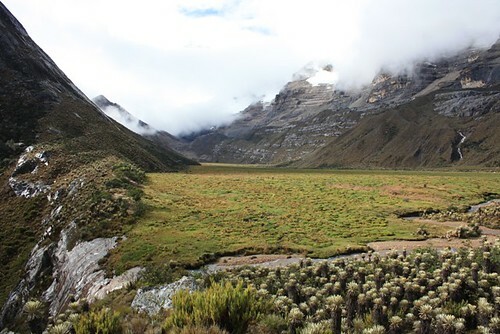 Getting to the Sierra Nevada del Cocuy isn't an easy thing to acomplish by bike. 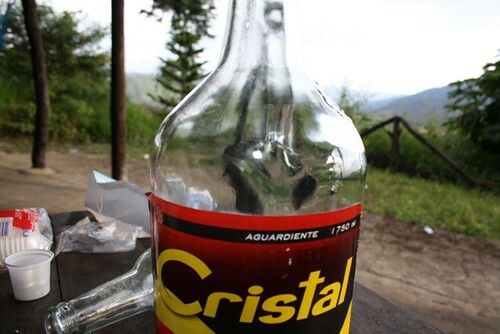 I had anticipated it taking me a day or two from Bucaramanga...But then I did get a little waylayed by some paragliders, a surprise birthday party, some basketball fans, a man in a wig, a maricahi band and something that I recommend you never drink called "aguardiente". Then came the toughest stretch of road I've cycled sinse the Careterra Austral. Stupidly steep, narrow, ugly gravel and crossed by gushing rivers on every bend. I arrived at the little village of Guican almost a week and a half after leaving Bucaramanga. 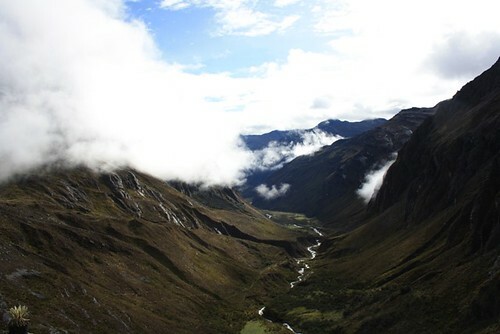 A small pueblo perched on the side of a mountain valley with a steep sloped central square. At five-thirty in the morning, at the corner of this square, I found myself waiting along with 5 or six locals, for the lechero. 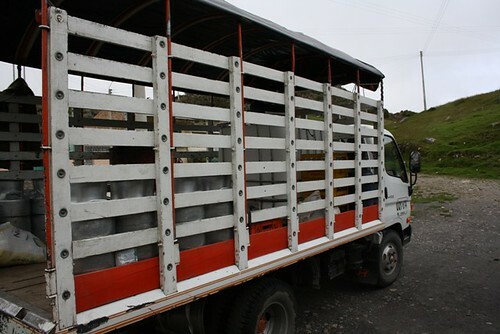 This is an open-sided truck that drives a loop of the mountain roads, collecting small pails of milk from tiny farms and moving about various things like sacks of potatoes, kids going to school, boxes of tools, cowboy farmers (in thick woolen ponchos, ganster hats and welly boots) and a weirdly dressed gringo who wants to go hike in the mountains. Well, after a very cold ride (for those poncholess idiots), getting stuck in the mud and stopping every five minutes to pick up milk the journey to Cabañas Kanwari took five hours. I could have walked in three, but I guess it was a novel experience. 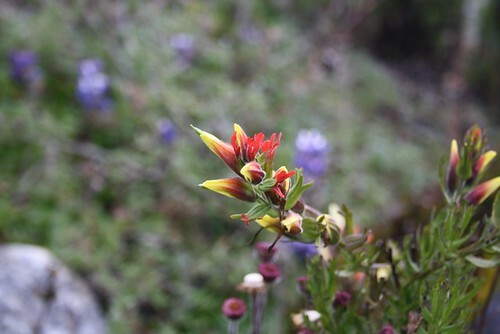 By the time I reached the cabañas it had began to rain. I scutled into a hut and downed a few tintos (coffee) and ordered a slap-up lunch. This would be the last decent meal before the hiking rations of pasta, rice and oats. It was still raining after lunch but I began the walk. 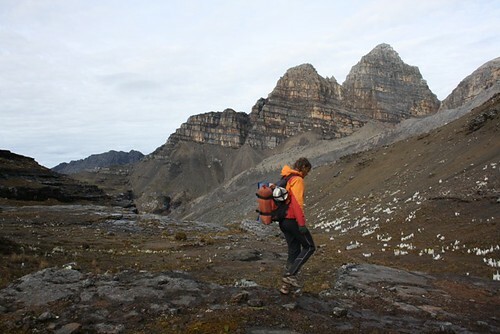 Once I'd hiked to the end of the road, I continued along a track up to a pass and down into a valley. By this stage I was in the mist and couldn't see much at all. The valley was waterlogged and vegetated by the strange, triffid-esque cojine plants unique to this mountain range. Just as it was getting dark, with the rain still lashing down, I found the first lake and put my tent. I was in for a cold night. My sleeping bag has now lost a lot of its feathers. With a wet me inside it, it doesn't provide much warmth. 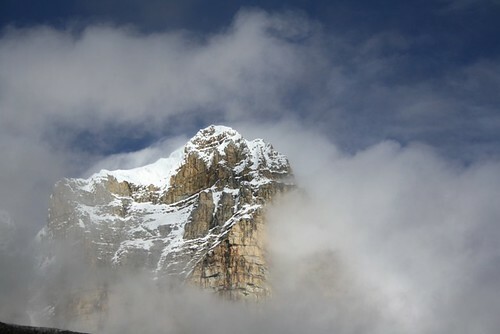 Also, I wasn't well aclimatised and insomnia is one of the first symtoms of altitude sickness for me. But the cold was the worst thing. Every few hours I warmed up the tent by boiling up some water. Unfortunately I couldn't make tea as I forgot the tea bags so I just had bowl after bowl of hot sugary water. I was packed and walking as sunrise broke. I didn't see it as it was still misty. The terrain switched from bog to rocky trails. 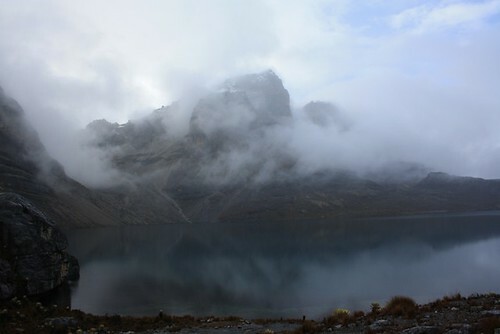 I climbed another two 4000m passes with towering cliffs disappearing into the clouds with Laguna del Isla in between. 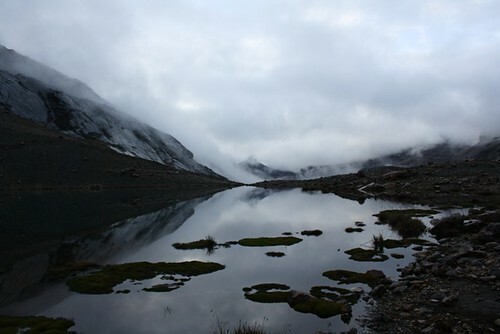 At mid-day I reached Laguna Avellanal and stopped to cook some pasta for lunch. Just as the water came to the boil a hail shower started pelting me. There was no shelter but I decided to wang the tent up by the lake double quick. Then I moved my bag indoors and clamboured over the boulders with the furiously bubbling hot stove in my gloves. Inside it was quite plesant as the hail bounced off the flysheet. I settled in to eat dinner and read "Flashman". 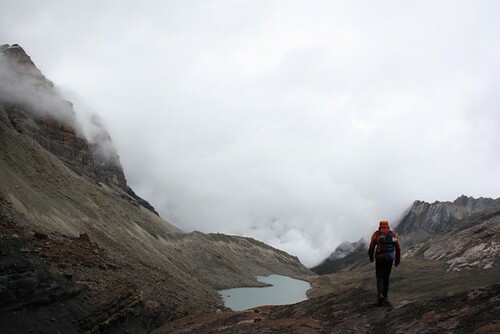 By morning I had made up my mind I was going to just turn around and march a nine hour slog back to the cabañas and give up on this hiking lark. 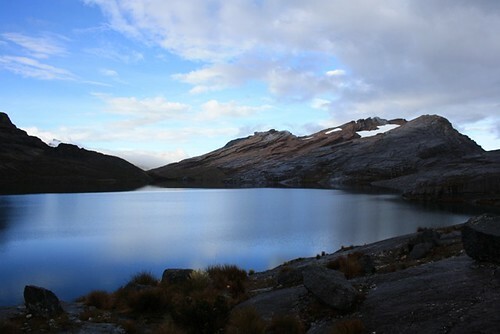 But when I got out the tent the mirror flat lake reflected the surrounding mountains. The mist had risen, not completely, but enough to encourage me. I packed and set off. Even so, I wasn't keen on too many more cold nights in my clapped out sleeping bag. I put in a 10 hour march, rolling together two of the planned days. It turned out to be quite a nice day, and by lunchtime the mist had risen quite a bit. I crossed Valle de Cojines a swampy place with rows and rows of triffids. I didn't bother to pick a careful route through the marshy ground. My feet were wet anyway so I just stomped through spashing mud. I had a quick bowl of cold oats for lunch, an insurrance measure against rain. Rain that began shortly after I put the pan back in my sack and started on the next day, if you see what I mean. 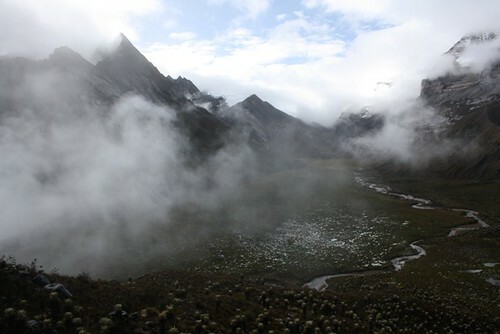 Now I was back to mist and rain and after 4 hours I reached Laguna de la Plaza. It looked like a sea, the other side disappearing into mist. The map said an hour walk to the campsite. It was 2:30pm so, although I was cream-crackered, I assumed I would have time to walk the further 3 hours to the nearest Refuggio. Ha. The walk round the edge of the lake was more like a scramble on a series of wet terraces which sloped a hundred metres above the lake, with a film of water running over them. I slipped up several times and decided that going slow was the best course of action. I'd been walking nine hours and hadn't slept for nearly sixty. There was no trail and the cairns were far enough apart that you couldn't see the next one in the mist. My photocopied sketch map was next to useless. And then came the reward. This post relates to my bike trip in South America in 2010.